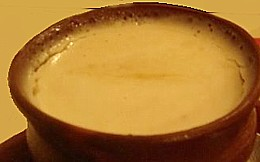 a home-made version of the famouw sweet yogurt dish from west bengal. Heat milk to a temperature not too high, enough for it to curdle. In a pan, add 2 tsp of sugar and allow it to melt and eventually caramelise. Add it gently to the lukewarm milk (be carefull with the caramel as it can cause severe burns on your skin, if comes in contant). Now add the remaining sugar to the milk and let it melt. If required, turn on the heat and then allow it to cool down to the previous temperature. Clean the clay handi properly and pour in the milk into it. Now add 1 tsp of already prepares curd and mix in well. Make sure the whey does not separates out. Keep this handi, covered, in a warm place for at least 6 hours during summers and overnight during winter.